a few days ago was the first time i've pulled some produce from my garden this season. this is only my second year having a garden, and my first growing green beans. growing a garden (even a little one) gives so many gifts. - i get to have fresh, delicious, organic produce for my family to eat. it doesn't get any better for you than walking across the yard, picking, and cooking it up for dinner. and taste... i don't even need to mention the quality of taste. - i get reconnected with nature. it's real easy to walk into a grocery, pick out your food, pay and leave without giving it a second thought. but when you grow it yourself, you remember why we so desperately need a good balance of rain and sun... you fight the pests that constantly threaten your crop and you think of the poor farmers who have to do the same on a larger scale (especially the ones who try to do it organically)... you work the ground with your fingers and you remember what it's like to play in the dirt as a child... above all it reminds me of how thankful i am of all the natural processes created to feed us, and feed us well. i have no idea of the scientific process behind what's in the dirt, how the roots feed the plants, photosynthesis and what-not, and pollination, (etc.) that ultimately gives me my yummy veggies, but mmm. mmm. mmm. am i thankful for those processes!?! - it keeps me in touch with my grandmother. mawmaw is THE family gardener. 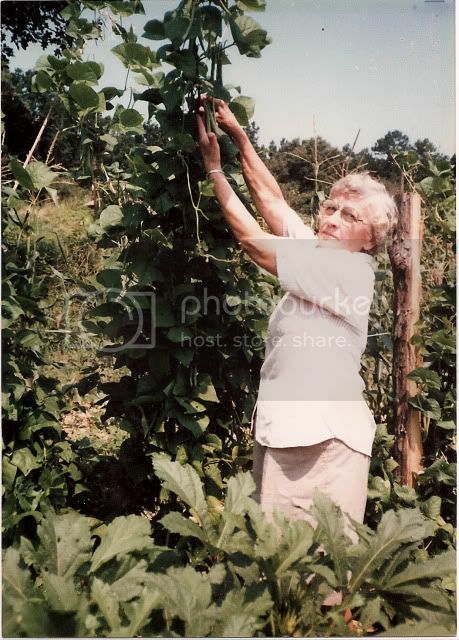 any questions i have, any pests i see, any any thing having to do with my veggies or working the georgia clay (er, not working it rather) i call up my mawmaw. she can expect at least a call a week if not 5 calls a day when it comes to me gardening. this year is much easier than last but it's still new territory so i choose not to tackle the terrain of vegetable gardening alone - i bring my mawmaw along with me. sitting around my great-grandmother's house - we called her Nannie - on the front porch and in the back yard were circles of women, my kin folk. as they sat outside they pulled the stem, pealed the string, and snapped the beans into smaller sections as they chatted about life and things of the times. maybe i helped out a grand total of ten minutes before i scurried off to find the "treasure tree" or chase my cousins around. but that brief moment of helping out, brought me to where i am today. frozen over my kitchen sink. thinking of a memory so vivid i can almost see it, feel it again. astounded at the power of my sense of smell - and thankful to the Lord most high that he made us creatures of feeling, sensation, love, and memory. what i wouldn't give to join those ladies today, to have the same and other similar conversations as we worked with our hands prepping the food for tonights meal. oh the things i would ask! the discussions i'd join! i'd try my very best to freeze those faces and the words spoken in my memory. what a joy to know that what i do remember was there, locked up tight, and the only way to open it was to revisit the same task i did all those years ago. i think i'll be growin' my own green beans for the rest of my life. Aww Lindsey-I love this! Reminds me of my sweet Granny Lester. And it makes me want to plant a garden too! But alas, I kill everything. Love this....I remember those days too....or my Nannie Herman and our Nannie Craven using the aloe plant on my burnt skin while sitting on the front porch of Nannie Craven's house...I have this picture of Nannie (that Karla gave me) sitting out in my sewing/crafting room!